Digital surrogates from the PLATO Notes Files contain digitized notes exchanged between developers and users of PLATO system, during the evolutionary implementation of the world's first wide-area computer network devoted to education. Digitized notes include lesson notes with developers' instructions, as well as users' experiences and questions related with the system use. PDF files contain scanned copies of the original material and .TXT files contain transcriptions of the original digitized material to facilitate its access. PLATO was computer-based learning environment developed by physicists and engineers at the University of Illinois circa 1960. It was the first use of a computer for pedagogy and the first time-shared education system. See the creator's biographical note for more information. 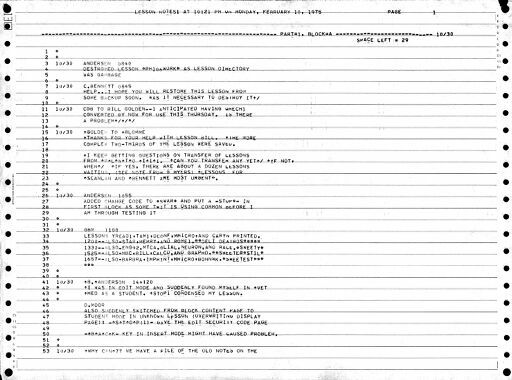 The PLATO System Notes Files (Digital Surrogates), 1972-1976 are managed by the University of Illinois Archives and do not feature precise descriptive information for each item. Discover their contents by browsing the folders and files. For more information, contact an archivist at illiarch@illinois.edu.